Newport Poor Law Union was one of the second wave of Irish unions created between 1848 and 1850. Newport Union formally came into existence on 8th October 1849. It was formed from the northern part of the Westport Union. 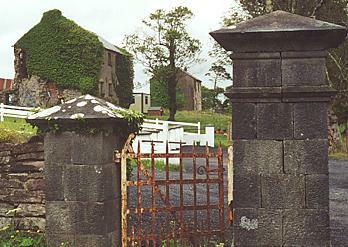 Newport former workhouse entrance from the west, 2000. 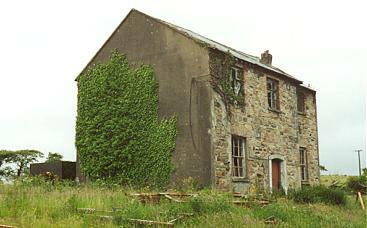 Newport former workhouse from the south-west, 2000. In 1879-81, Ireland suffered another agricultural crisis, with bad weather and poor harvests leading to food shortages and unemployment, with the west of Ireland being particularly afflicted. The British government instigated an ineffectual scheme to fund public works schemes via loans to land-owners. However, the main source of relief during the winter of 1879-80 came from voluntary and charitable organisations, with many Boards of Guardians restricting out-relief either as a matter of policy or because of lack of funds to pay for it. In the summer of 1880, the Local Government Board dissolved the Swineford Board of Guardians (and also those of the nearby Swineford and Belmullet unions) for failing to collect sufficient rates to provide relief. The LGB then installed its own vice-guardians to try and restore the union to financial order. The relatively small rateable value of property falling within the Newport Union made it increasingly difficult to raise sufficient funds for the union's purposes. Following a petition from the board of guardians, the Irish Local Government Board agreed to amalgamate Newport with the Westport union, contrary to the wishes of the Westport guardians. The Newport union was officially dissolved on 30th September 1885. Some parts of the former Newport workhouse buildings survive and are used for residential accommodation.